All successful businesses are built on customer loyalty. That loyalty is earned over time by providing excellent products plus a great customer experience throughout the sales process. 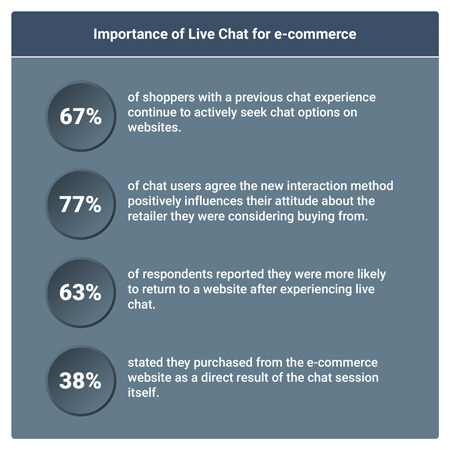 When your B2B or B2C business is online, introducing e-commerce live chat takes customer service and engagement to a new level, building loyalty and trust, and substantially boosting your sales. Live chat is a platform that allows you to assist visitors to your website in real time. Shoppers talk or message online with a customer service agent, who can immediately answer their questions or suggest products that might best fit their needs. This type of on-the-spot engagement is becoming more and more popular, especially with millennials, who quickly lose interest if they need to wait for a response. Reactive: The user needs to request assistance by clicking a button that says something like “Chat with us” or “Need help?”. Proactive: Here the user is invited to chat, usually by a pop-up window which appears when specific criteria are fulfilled, for example, after certain page sequences or if the customer looks likely to abandon their shopping cart. According to one recent study, the success of proactive chat, at 105% return on investment, far outweighs that of reactive chat at 15%. According to Zendesk’s Benchmark report, at 92%, live chat results in the highest satisfaction rate across all customer service channels. This isn’t surprising given that an instant response is far faster than anything provided by other support channels, such as email or social media. Like email or social media though, it also allows customer service agents to share educational links and documents, which can’t be done via a phone call. Conversions: When e-commerce customers have questions about their purchase, they tend to abandon it unless they get a quick answer. Online chat allows your service agents to instantly answer questions from wavering customers, helping to close the sale.According to the American Marketing Association, this boosts conversion rates for B2B customers by 20%. Other sources show that live chat converts 3 to 5 times more customers. 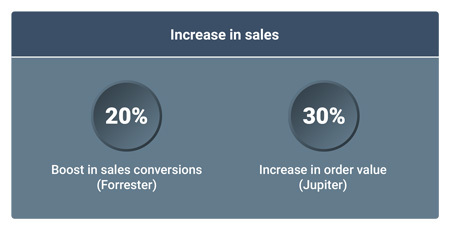 Increase in order values: When a customer is interested in an accessory for the product they are buying, for example, a mobile phone, suggestions from a live chat agent can help make that sale. With full visibility of the purchase as it happens, the agent can up-sell or cross-sell a related item. Either way, these extra sales add to the original order value.When Virgin Airlines deployed live chat, their conversion rates increased by 23% and their average order value by 15%. When questions are quickly answered on the spot, helpful recommendations can be made and issues are instantly resolved, it’s hard for customers to hold onto objections. Instead they are quickly moved through the sales cycle to checkout. 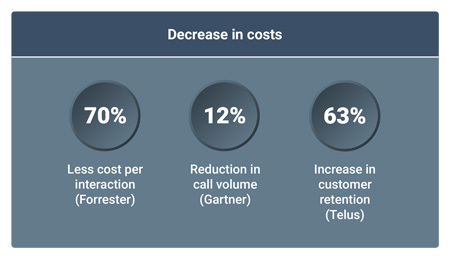 Cost per interaction: As customer service agents can take part in multiple live chat conversations at once (which is far more difficult over the phone), they use their time more effectively, while providing faster support to customers. This translates to a lower cost per interaction. Call volume: Once customers have experienced the enhanced service provided by live chat, it quickly becomes their preferred method of communication. Your call centre therefore receives fewer phone calls and emails, and eventually you’ll need far fewer call centre agents. Retention: Live chat increases customer retention by between 48 and 63%. Those returning customers are already loyal, which makes selling to them that much easier and more cost effective than converting new customers. Even as both our business and private lives move more and more online, we still have a human need to feel seen and heard for who we are. At the same time, customers want quick and convenient service, and we need to run our e-commerce business in an efficient and scalable way. Live chat provides the perfect solution, combining technology with the personal contact our customers are looking for. Add together higher conversions, increased order values and great service that keeps satisfied customers coming back time and again, and the result is increased lifetime value from everyone you sell to. While implementing live chat software on your website is simple, rolling it out in your business needs some planning. At Comalytics we recommend integrating to Zendesk, an award-winning, comprehensive live chat solution. Zendesk offers a 30-day free trial, after which you can test it out further in your business with a basic package that costs just $5 an agent. There are many other live chat options though, and it’s worth investigating them to find the one that fits your business best. Contact us if you’d like to discuss integrating to Zendesk or any other package. 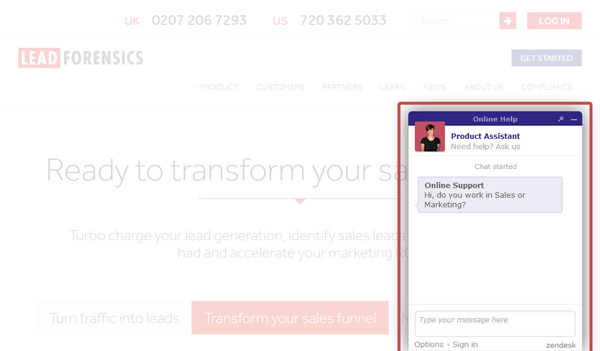 Live chat integration is already included in our Premium B2C package. Do you have enough website traffic to justify the cost of agents and live support software? Would it make sense to grow your live chat support gradually rather than all at once? What impact will this have on other support channels? Do your existing staff members have the time and capacity to man your live chat support? Does your support team know your products and website really well? It’s a good idea to provide training aligned to achieving your goals, such as increasing conversions and/or order values. How can you make your live chat support team more approachable? Loading photos and names of your support staff, and making those visible to customers, adds that human element which is so important. Are your processes clear? To keep everyone on the same page, consider putting in place rules for chat sessions, as well as scripts for a more active or passive approach, and consistent responses to frequently asked questions. What live chat features do you really need in your business? It can take some effort to identify the software that best matches those requirements. How sensitive is the information you are working with? You may need encryption to protect everyone involved. Take some time to think through these important questions before you dive into live chat implementation. If you’re looking to boost your e-commerce sales and build long-term loyalty via great customer service, live chat is the answer. It’s also the way of the future, the perfect combination of efficient technology and human contact – two things that will never go out of fashion. Contact us to discuss your live chat options.